Little, Brown and Company, 9780316547185, 352pp. A life-changing secret destroys an unlikely friendship in this "magnetic" (Meg Wolitzer) psychological thriller from the Edgar Award-winning author of Dare Me. You told each other everything. Then she told you too much. Kit has risen to the top of her profession and is on the brink of achieving everything she wanted. She hasn't let anything stop her. But now someone else is standing in her way - Diane. Best friends at seventeen, their shared ambition made them inseparable. Until the day Diane told Kit her secret - the worst thing she'd ever done, the worst thing Kit could imagine - and it blew their friendship apart. Kit is still the only person who knows what Diane did. And now Diane knows something about Kit that could destroy everything she's worked so hard for. How far would Kit go, to make the hard work, the sacrifice, worth it in the end? What wouldn't she give up? Diane thinks Kit is just like her. Maybe she's right. Ambition: it's in the blood . . .
Megan Abbott is the award-winning author of nine novels, including You Will Know Me, The Fever, Dare Me, and The End of Everything. She received her PhD in literature from New York University. Her writing has appeared in the New York Times, the Wall Street Journal, the Los Angeles Times Magazine, The Guardian, and The Believer. Currently, she is a staff writer on HBO's new David Simon show, The Deuce. She lives in New York City. "Smart, twisty, penetrating - I literally could not put this book down"—Pop Sugar, "The 25 New Books to Put in Your Beach Bag This Summer"
"[Abbott] is in top form in this novel. She resumes her customary role of black cat, opaque and unblinking, filling her readers with queasy suspicion at every turn." "...brilliant...beneath the glittering carapace of Abbott's lush, skillful, subtle writing, it's impossible to know what we're supposed to think. One of the strengths of this novel is that it doesn't mind what we believe--it is cooly at peace with whatever our take on matters might be...we, as readers, are made entirely responsible for our own theories and conclusions. In that sense, this is an exceptionally plausible work of fiction...The wrong kind of ambiguity in a crime novel can be fatal. Abbott judges it impeccably here..all of this Abbott pulls off with groundbreaking skill...excellent." "Master of mystery Abbott...brings her noir sensibility to the world of elite teen gymnastics." "Abbott commands our attention with a plot that somersaults and back flips whenever a safe landing seems in sight. But what's even more ingenious is how artfully her novel draws us readers into that closed world of BelStars Gym...You Will Know Me is a terrific accompaniment to this summer's Olympic frenzy. It's an all-around winner." 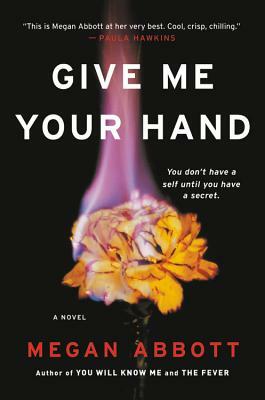 "If, then, you are secretly craving a modicum of drama to go with your women's gymnastics, you should read Megan Abbott's leotard-centric You Will Know Me...the style of her prose, and her focus on teen-age desire, ambition, and secrecy, have a broad, cinematic appeal."